The QBX KAZE’s elegant metallic mesh front panel is the face of anultra-compact case with one of the most stylish designs a pc case has ever seen.With the ability to house a full powered gaming computer with the latest technology,it allows the user to install up to 7 fans , thus providing the absolute best cooling on the market for a case of its kind. 7 fans with water cooling and much more, all in a compact case. QBX KAZE can fit almost anywhere you could want to put a computer in. See and believe. 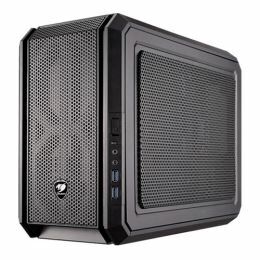 The ultra-compact design of the QBX KAZE can host the best gaming technology of the market and keep it well cooled. Advanced USB 3.0 ports for maximum data transfer speed. With QBX KAZE, you gain access to new generation games in all their glory. Up to 7 fans with Water Cooling. Pro-Cooling design: the openings and fan placements are located to ensure a constant fresh air flow. Independent Power Supply Airflow: The air does not even get into the case, it colis your PSU and gets out again.